“Lalaloopsy” is an American line of plastic rag dolls. 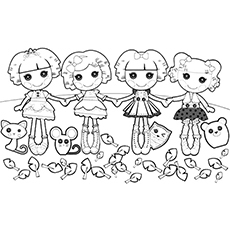 Each Lalaloopsy was born on a special day and has a distinct personality. They come together for a daily adventure in a whimsical world of surprises called the Lalaloopsy Land. A variety of large and small Lalaloopsy dolls have been released over time. This was followed by Lalaloopsy themed video games and television series. The range was released as Bitty Buttons but but was changed to Lalaloopsy shortly after the launch. 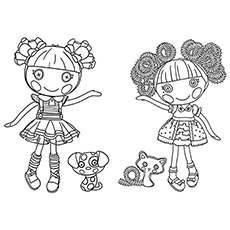 Kids totally love Lalaloopsy coloring pages to print. The diagrams have simple shapes and patterns, making it easy for younger kids to grasp. 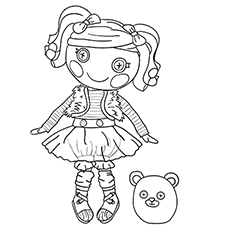 Here are 20 Lalaloopsy coloring sheets for your little ones. 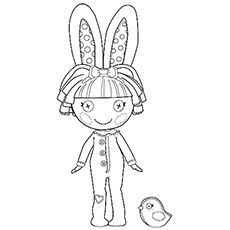 This is a cute coloring sheet of Ember with Silly Hair Doll. Ember and Silly Hair doll are the closest friends in the Lalaloopsy Land. Both are curious daydreamer and love to explore the wonderland. They also share similar interest. Both love playing croquet, attending tea parties and painting the roses. 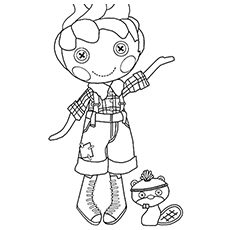 Here is a coloring sheet of Forest Evergreen, the best lumberjack of the Lalaloopsy Land. His name comes from the forest that makes up most of Lalaloopsy land. Forest Evergreen is an outdoors-man, who loves climbing trees and stomping around in his boots. He is a fair-skinned doll with pink cheeks and black, button eyes. He wears a red-checkered shirt with denim overalls. The cute doll you see here is Baley, the greatest thinker of the Lalaloopsy Land. She comes up with great ideas in times of emergencies. She is named after the common materials found on a farm like bale, sticks and straws. Her pets are two dark gray crows. Baley has a sack textured like skin and bright yellow straw like hair with uneven cut bangs. She wears a neon pink dress with bright orange blouse and gloves. Bea is the smartest and the most well read resident of the Lalaloopsy Land. She has the largest collection of books in her personal library. She has a pink pet owl. 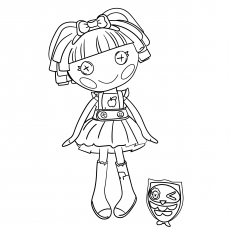 She acts as a teacher of the Lalaloopsy land and loves to educate the little ones. Bea has a fair skin with sky blue eyes and pink cheeks. She is always shown wearing black shirt with a jumper and pink leggings. This a coloring sheet of Berry Jars ‘N’ jam, the best provider of homemade jam and berry pancakes. Berry makes the highest stack of buttermilk pancakes in the town. Her pet is a small, white cow. Berry is a fair-skinned doll with pink mane. She wears a pink plaid dress with multilayer skirt and short puff sleeves. 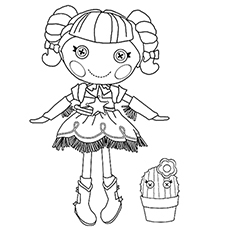 This coloring sheet features Blossom Flowerpot, one of the best gardeners in the Lalaloopsy Land. Her pet is a cute butterfly. She is a caring and cheerful doll who loves to dig in the dirt. Her name is based on her ability to make anything she plants into something beautiful. Blossom Flowerpot has a light brown skin with bright pink cheeks. She wears a white dress with teal blue lining and green spots. 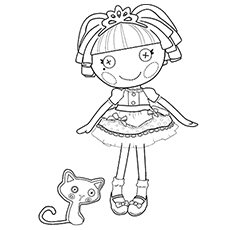 Meet Crumbs Sugar Cookie, the best baker in the Lalaloopsy Land. She starts her day by baking all her favorite treats. Most of her problems can be solved by popping something in the oven. All the citizens of the Lalaloopsy Land go to her to get yummy pastries. She is a fair doll with soft pink cheeks and deep pink hair. She wears a fuchsia pink dress with ruffled link and a white and yellow-checkered apron on top. 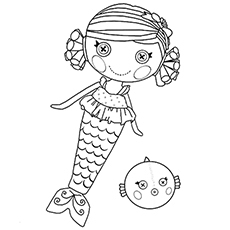 This coloring sheet features Dot, a profound stargazer in the Lalaloopsy Land. She is a dreamer who always has her heads in the clouds. Her mind is always filled with thoughts, ideas and beautiful sights. Dot is a dark skinned doll with pink cheeks and blonde-yellow hair. She decorates her hair with a red headband. This is Jewel Sparkles, the most graceful princess in the Lalaloopsy Land. She is dressed in a cute dress with puff sleeves, belt and socks. Ask your child to add some colors to make this coloring sheet look beautiful. Jewel enjoys being in the spotlight and looks for attention whenever she can get it. She keeps Persian cat as a pet. Jewel is a fair-skinned girl with black eyes and a small beauty mark below her left eye. Her hair is pastel pink in color and is split into two sections. The cute little mermaid you see here is Coral Sea shells. 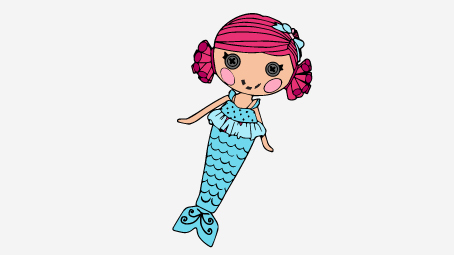 She is an imaginative doll who wishes to be a mermaid. She lives in a sandcastle by the beach. Coral loves swimming and eating seaweed salad. Her pet is an orange blowfish that can squirt in water. Coral is a fair-skinned girl with pink cheeks and bright magenta hair. She is normally seen wearing a blue mermaid costume consisting of a blue top with frilled sleeve and soft blue frilled skirt. 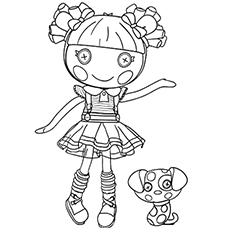 This coloring sheet is of Ember Flicker Flame, the fighter of the Lalaloopsy land. She is a brave, little doll who is always ready to save the day. Ember is a short-tempered woman, who gets angry over small things. Her name comes from the flickering flames and ember coals. She keeps a Dalmatian as a pet. This fair-skinned doll has orange hair with straight cut bands. She wears a striped white shirt with a red frilled skirt. 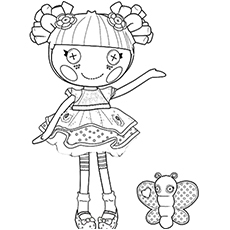 This is Holly, the jolliest and most cheerful resident in the Lalaloopsy Land. Her name is taken from a traditional festive plant. She is a helpful doll who loves making lists and wrapping presents. She keeps a cute reindeer as a pet. Holly is a fair-skinned doll with black eyes. She has light blonde hair with two messy pigtails. She decorates her hair with a red ribbon. Here is a coloring sheet of Mittens, the biggest enthusiast of snow. She loves snow fights, hot cocoas and snuggling by the fire. She keeps a polar bear as her pet. Her name is taken from Mittens, one of the clothes worn during the winter. Mittens is a light brown-skinned girl with pale cheeks and black eyes. She wears a pink and magenta long sleeved shirt with a blue mesh skirt. 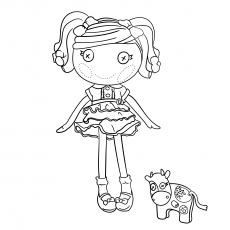 This is Spot Splatter Splash, the most artistic resident of the Lalaloopsy Land. She lives in a two-storey house set on top of a painter’s palette. She keeps a zebra as a pet. Spot is an excellent painter and does not hesitate to express herself through the art. She always manages to make her friends smile with her silly masterpieces. Spot has a light brown skin with peachy cheeks. She has orange colored hair that is worn in pigtails. She wears a colorful dress with matching boots. 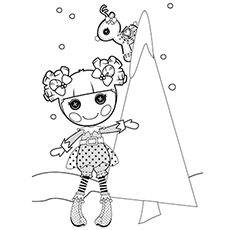 This coloring sheet features Peanut Big Top, the greatest ringmaster and circus performer in the Lalaloopsy land. Her pet is a small, lilac elephant. She is a prankster who spends most of her time practicing new tricks or performing in a show. She is a light-skinned girl with a small red mark below her left eye. She has neon purple hair that she wears in pigtails. She decorates her hair with red-orange bow-clips. 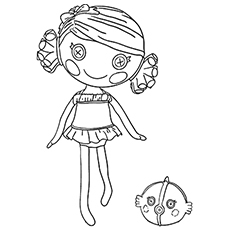 This is Tippy, the most talented ballerina in the Lalaloopsy Land. She keeps a beautiful white swan as her pet. Tippy totally loves being on stage, even though she falls off every once a while. Tippy is very graceful and loves putting on recitals for all her friends. This beautiful girl ties her hair in pigtails and decorates them with pink ribbons. She wears a fancy ballerina dress with ballerina slippers. 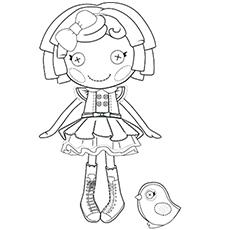 Pix E. Flutters is the magical doll of the Lalaloopsy Land. She is named after her fluttering wings. She is an optimistic doll who always looks at the bright side of the situation. Pix is a brown-skinned girl with pale, pink cheeks and black button eyes. She has green colored hair that is tied like a ponytail or bun. She wears a pink, multilayered skirt with a tank top. Cotton Hoppalong is a bouncy doll of the Lalaloopsy Land. She is an energetic doll who is always bouncing around, thinking of crazy ideas. Cotton Hoppalong wears a bunny suit with orange and magenta pink markings. She also wears a pair of bunny ears. Meet Prairie Dusty Trails, a rowdy buckaroo who enjoys doing rope tricks. She keeps a single cactus as a pet. This adorable doll has brown hair that she wears in braided pigtails. She is mostly seen dressed like a cowgirl in orange blouse and pink skirt. 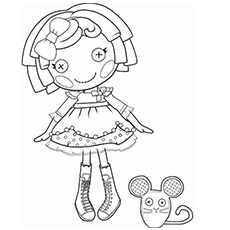 We hope you liked our collection of lalaloopsy pictures to color. 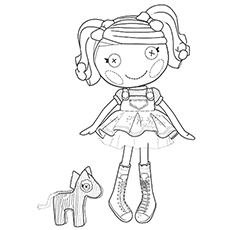 These free printable Lalaloopsy coloring pages online will keep your kids entertained for hours. 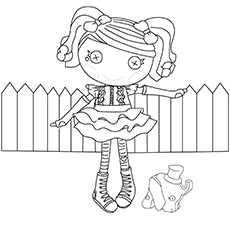 Do share your experience while creating your own Lalaloopsy coloring book views with us in the comment box.